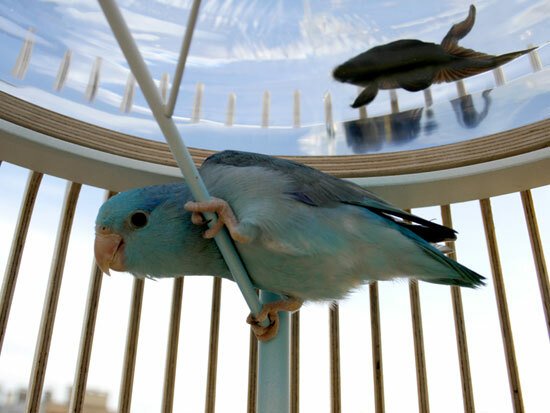 Caged birds and tanked fish rarely have opportunity to visit each other, and the mere fact that these pets are contained makes them more vulnerable to boredom. 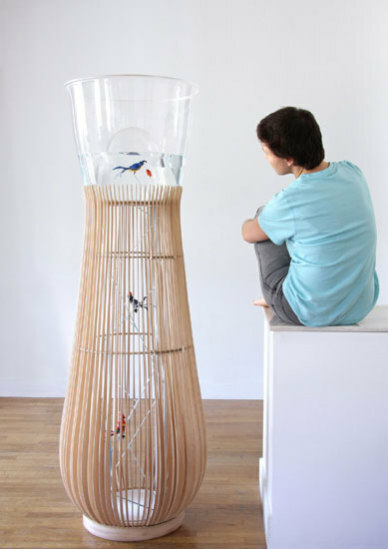 French designer Constance Guisset has designed a new world for pet fish and fowl, one where the air and water world can interact a bit. In two separate designs, one to house smaller birds and one for medium-size birds, Guisset elegantly reates an atmosphere for the two species to mingle, or certainly to view each other. Not only that, but they give humans an opportunity to watch. And we love to watch. 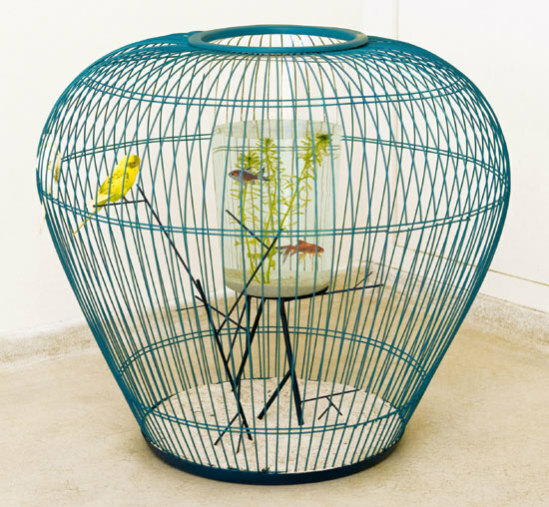 News, a whimsical title for the first cage design, is a very modern wire bird cage, vase shaped, and ready to fit into the poshest decor. The twiggy perches emulate nature a bit more than the horizontal dowels that come in manufactured bird cages and give the whole cage an airy look. Duplex, Guisset's second environment for pet birds and fish, is cleverly designed to create more contact between the two species by having the aquarium, which is thermoformed, dip right into the bird arena. I wonder how these environments would change the behavior or character of the pets. It would be interesting to observe. Maybe it would give the caged bird a reason to sing. This is a strange invention but very creative. It would actually be funny to watch the interaction between the bird and fish. I would even send it to WebVet.com for their bird talent contest this month. Let’s see if the bird has a conversation with the fish! The grand prize is $2,500. Thanks for your comments. I would love to see the "interaction" between the two. I think that they would learn each other's "ways," and know when something wasn't right with the other. I don't know much about pet fish... how sensitive they are to other creatures. Interesting questions. If I do see a cage like this for sale I will definitely try it out.